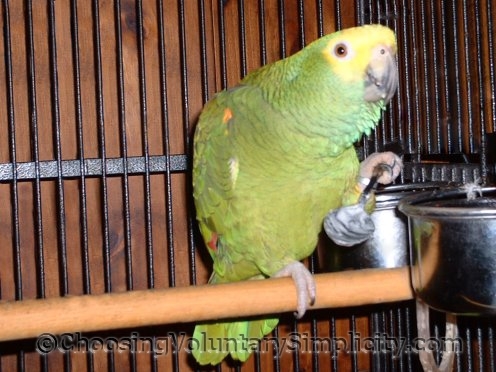 Several people have written to ask if I would share the techniques I used for teaching our yellow-headed Amazon parrot to talk. I don’t feel I can take the credit for our parrot’s astonishing vocabulary, because although I did teach him his first words and phrases, his present-day “conversation” includes many, many words that I did not specifically teach him. He is continually expanding his vocabulary in the same way that a very young child picks up new words… just by interacting with us, listening to the words we use, and then trying out and using those words himself. One thing I have learned, though, is that teaching a bird to talk requires repetition, repetition, and repetition… and even more patience. Despite what some people believe, either a male or female bird can be taught to speak, but before any bird will talk, it must feel completely at ease with the person teaching it. During a training session, all distractions or noises should be eliminated. Actual training sessions should be short, no more than fifteen minutes, and they should be repeated at least twice each day. The same word or short phrase should be repeated over and over again until the bird learns to say that word or phrase clearly. Only then should you try to teach the bird something else. Audio tapes can be purchased that are especially made for this type of training, but before you try this method, be certain that the phrases on the tape are something you wouldn’t mind hearing over and over and over again. One of our parakeets learned an incredibly irritating laugh, followed by “That’s funny!” in an equally irritating raspy voice by imitating the voice and laugh on just this kind of tape… and it became his favorite thing to say. Supposedly birds learn to talk more easily from women and children because their voices are higher pitched and easier for the bird to imitate. If a man is to be the trainer, he should speak at a higher pitch than he normally does, because when a bird tries to talk at a low pitch, the words are often not very clear. I have read that some baby birds don’t like to say the sounds of the letters m, n, and i… that even adult birds often will not say the letter s… and that words starting with the letters p, k, and t are the easiest for birds to repeat. I have not noticed any of these limitations with our Amazon or the other birds I have taught to talk. Some parrots love loud noise and are more apt to learn to talk if the trainer talks in a louder than normal, exaggeratedly enthusiastic voice. 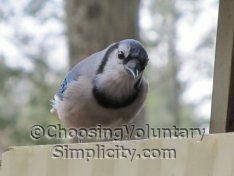 I have found that emphasizing the rhythm of the words and raising and lowering the volume of my voice at intervals works especially well when I am teaching a bird to recite the alphabet or how to count. Our parrot especially loves it when I sing with him, and he learns the words to new songs very quickly when we sing together. Most larger parrots don’t talk until they are well over a year old, and smaller parrots, like parakeets, probably won’t talk until they are around three months old. The first words learned are the most difficult, and this initial learning process may take weeks or even months, but after about fifteen or twenty words have been learned, most birds will pick up new words or phrases very quickly. One thing to remember with phrases is that if the bird has difficulty with some part of the phrase, don’t try to correct just the part it does wrong, or the bird will get confused. Instead repeat the entire phrase. I read an article in the Scientific American (or SciAm Mind, can’t remember now which one) about parrots. Large parrots are highly social with a significant life-span. Apparently, such evolutionary conditions lead to very well developed brains: unlike dogs and cats, parrots can pass the tests for rudimentary abstract thinking. They don’t just learn the words – they can understand many of them, including day-to-day objects, colors and shapes. I have a green-cheek conure who talks. One time, while during a move to new town, he spent about 2-3 months with my mother’s flock. She has a parakeet that is quite a talker, and when he came back home to me, he had picked up several new words from her! Do don’t forget to mention that if you have multiple birds, they will definitely pick up words from each other. We did not intentionally set out to teach him words, but he picked up words and phrases that were said frequently to him or around him. He learned quickly to love our astonishment and attention when he said a new word. I bred parrots of all sizes for a few years and raised some as my own pets from the egg. Currently I have 3 Alexandrines, 3 African Grey Congos, 1 Sulfer Crested Cockatoo, 1 Gofin Cockatoo and recently lost my Double Yellow Head Amazon. These are my children. My children have a 65 in. wide screen television. During the day I will put on something in a low tone for them to watch. The congos pick up words from the television as well as from us and make their own sentences and comunicate with each other. Having 3 of them together in the same room they never have a boring moment. We live in California and Dakota my male congo ran to the front of the cage looked at me and said “I’m from Baltimore.” He never got that from us. They are 4 years old now and their vocabs are beyond my expectation. To comment on the read up above about if a bird misspronounces a word do not correct that part but do the entire phrase over, I totally agree with. It sounds like you’re doing everything right. I think she just needs more time to get adjusted. In a few months I’ll bet you’ll be wishing she would STOP talking!